FREE delivery to United Kingdom in 7 - 9 weeks. 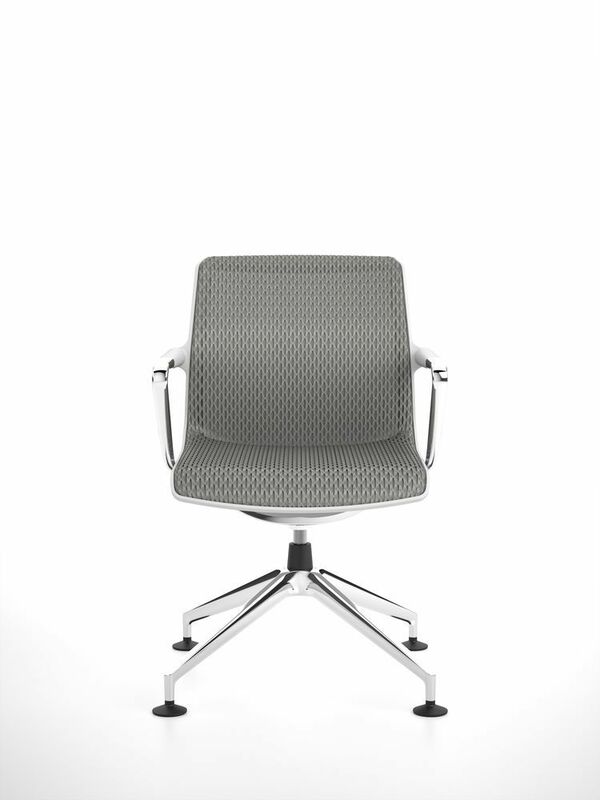 The Unix Chair is the ultimate all-rounder for office environments. It can be used behind a desk as a task chair or in front of it as a visitor chair. Unix is available in different versions that are ideal for conferences and meetings. And it is suited for touchdown workstations as well as waiting areas. The chairs structural design and the innovative padded mesh cover ensure a high level of comfort. Thanks to a wide range of colour options, it works equally well in sleek, functional office settings and in more expressive and personal work environments. Monochrome polypropylene in basic dark or soft grey. fabric or 3D spacer fabrics Diamond Mesh or Silk Mesh. Four-star base,polished die-cast aluminium on glides. Swivel mechanism with comfortable deep suspension. Antonio Citterio was born in the Italian city of Meda in 1950. He opened his own studio in 1972 and completed his degree in architecture at the Polytechnic University of Milan in 1975. Between 1987 and 1996, he collaborated with Terry Dawn to design many buildings across Europe and Japan. In 2000, Citterio and Patricia Viel formed a multidisciplinary office for architecture, interior design and graphics. The office operates at international level developing complex long-term projects in synergy with a qualified network of specialist consultants. The practice is now called “Antonio Citterio Patricia Viel”. Antonio Citterio works in the industrial design sector with companies such as Ansorg, Arclinea, Axor-Hansgrohe, B&B Italia, Flexform, Flos, Hermès, Iittala, Kartell, Maxalto, Sanitec (Geberit Group), Technogym and Vitra. He has received numerous awards, including the Compasso d'Oro in 1987 and 1995. Citterio has been a professor at the Faculty of Architecture at the Università della Svizzera Italiana in Mendrisio from 2006 to 2016. He was awarded the title 'Royal Designer for Industry' by the London-based Royal Society for the Encouragement of Arts, Manufactures & Commerce in 2008. Swiss manufacturer Vitra’s collections of furniture and lighting bring together the colour, culture and sophistication of the world’s most prominent designers.